Get the complete tactical package for your favorite gun with the Viridian C5L-R Sub-Compact Red Laser & Tactical Light Combo. The C5L-R fits perfectly between the trigger guard and muzzle and will work virtually with any railed gun. The Tactical Light features a white LED 100 Lumens of blinding light and with the elite Red Laser has a stronger brighter targeting dot for greater accuracy and intimidation. With the Viridian C5L-R attached to your favorite gun, you will definitely be prepared to tackle any mission. Will this fit a taurus millenium g2? Will this fit in an H&K VP9sk? How does it fit an XDS 9mm 3.3” barrel? BEST ANSWER: I purchased this from PSA for my XDS 9mm 3.3" barrel and it just fits. I couldn't really slide it on, just positioned it and rocked/snapped it into place. Snug fit but doable. Anyone know if this will fit A FN FNS 9C? Will this fit the xds 45? BEST ANSWER: Yes it fits nicely on there. Will it fit springfield xds 4.0 9mm ? Does this fit a fire storm mini? Will it fit a springfield 45 xd ? Good product given the price (I paid $130). Both light and laser are bright and clear, and the unit does not overheat while in use like some other higher lumen models. The light casts a fairly wide beam, which is ideal for most applications. I've never had it turn on accidentally while holstered, and the battery life seems reasonable. All of this being said, there are a few issues. The mount does tend to loosen a bit, so I'd encourage anyone who intends on using the laser as an aiming device to frequently recheck their zero. Additionally, I wish that Viridian had placed the laser directly centered in the housing instead of off to the right. If you do intend on purchasing this product and using the laser instead of your weapon's sights to aim, you may want to zero it at a longer range than you would other pistol lasers (50 to 100 yards). Zeroing at 15 feet means you'll be way off target at 60 feet (bullets will impact low and to the right of point of aim). Finally, if you have short fingers or small hands, you may find it difficult to manipulate the power buttons with your shooting hand on certain pistols, because the buttons will be too far forward on the firearm. 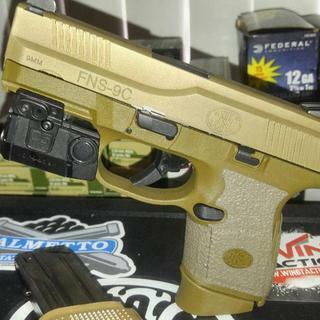 Was looking for a light for my FN FNS 9c. As most of you with sub compact pistols know, it's tough finding a good light that will fit. PSA had this light that I found would fit, and for 40 bucks cheaper than any other place online. I custom ordered a holster with the ECR feature and I couldn't be happier. Light is just bright enough for CQB, the laser is bright. You can't go wrong with this light, and with the price PSA is selling it for, you'd be crazy not to get one. The polymer that the brackets are made out of is very flimsy. If tighten tightly they bow badly and the laser still has wiggle to it if pressed. I definitely won't be trusting the laser. Just using it for a small footprint weapon light.